Fancy, fancy, fancy and delicious. 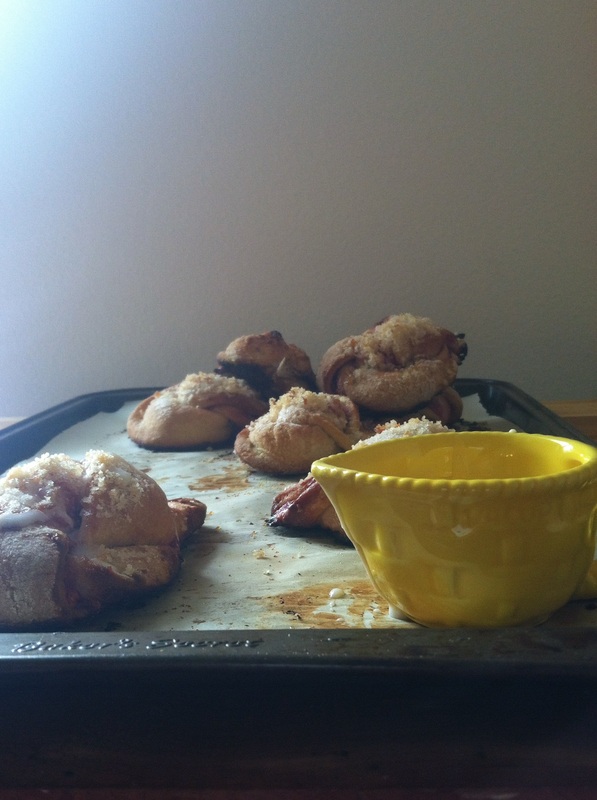 Hello readers, today’s post is in the high-class homemade fancy category. I went on a bread making binge and when it was time to use the last of the dough I decided a nice breakfast pastry was the way to go. 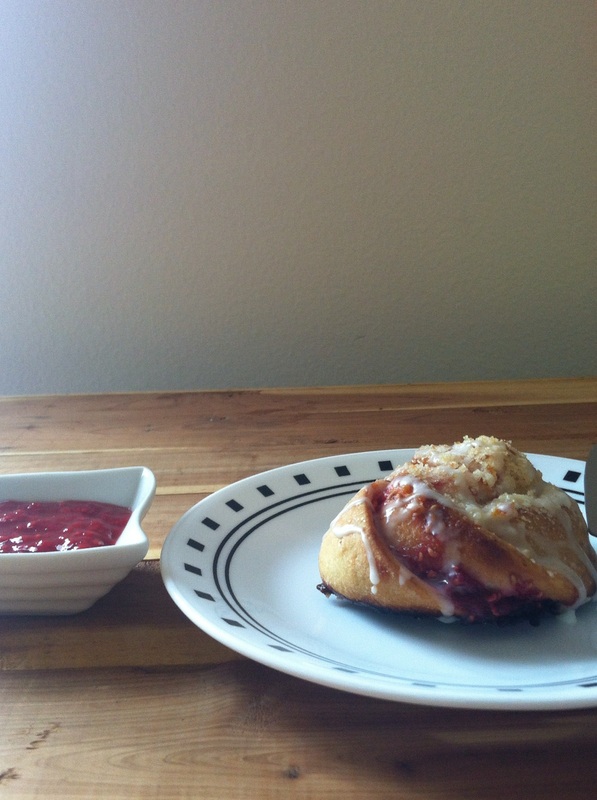 I had extra raspberry sauce (homemade of course) and some orange sugar on hand. I swear half of my recipes are by way of things I have on hand and by way of imagination. 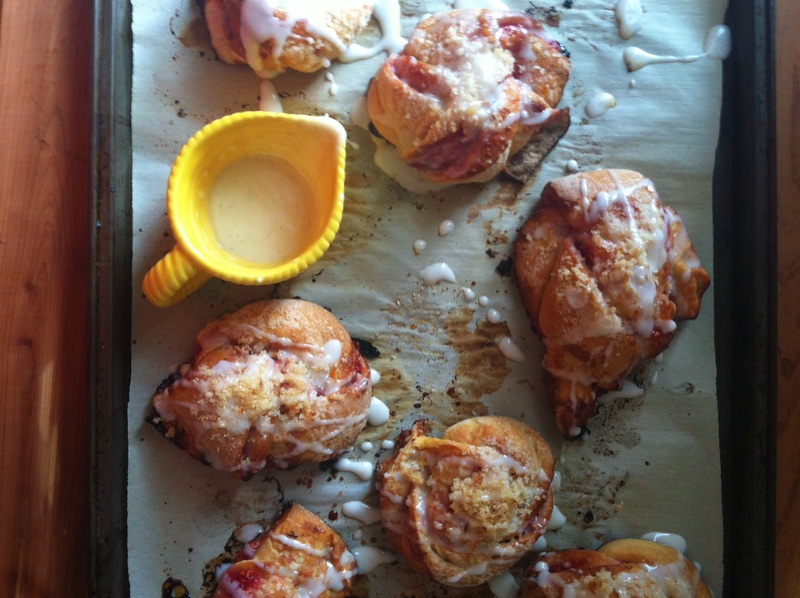 Btw: this is a brioche dough recipe which only adds to the fanciness of this post. Brioche is a sweet and butter enriched bread that of course has origins from Europe and a sophisticated air that resembles me stuffing my face of bread in a closet and not coming out until I’ve finished off the entire box. 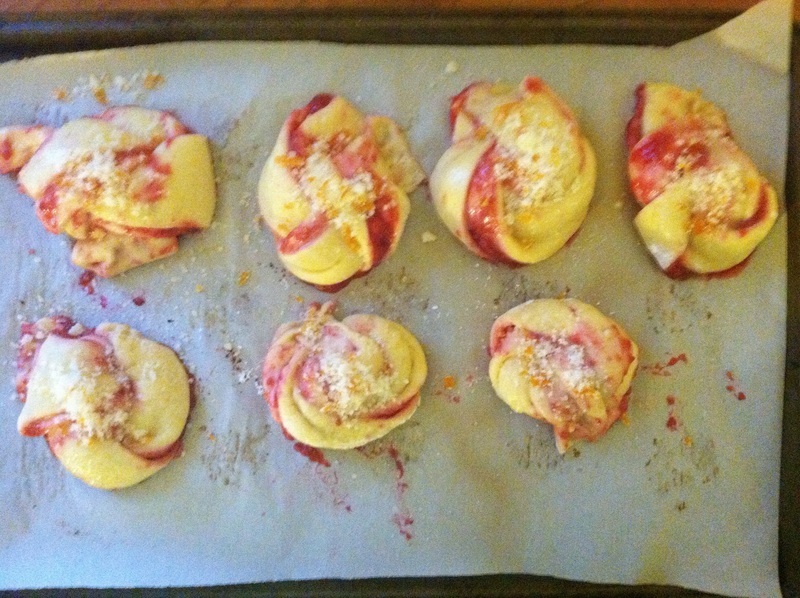 Behind the Scenes (BTS): Anyway, Raspberry and Orange Twist Knot Rolls? How does one come to get that idea? Very simple, I like fruit, I like bread, I like breakfast, and I like to add all of them together; now I know this isn’t a original idea, I’m more than sure it’s been done before, but I like what I’ve done with my recipe, I whole-hardheartedly believe that raspberry gets the ugly end of the fruit stick, right before figs and after blackberries and because of that I’ve taken the gauntlet and voted myself up-lifter of all things raspberries (not all things, there are somethings that I’ve made with raspberries that have been so nasty, I’m making a nasty face right now just remembering how it tasted). And orange goes well with raspberries and basically all other fruits; orange is another fruit I feel isn’t utilized enough. The zest and flavors of oranges are bar-none original and can rarely be replicated in any factory. Twisting: When it comes to twisting these rolls, this can be a bit complicated. I feel like kicking myself for not taking step-by-step pictures of how to do this, but the next time I make it I will and will re-edit this post with the steps. In pure literary detail on how to twist the only way I can think to explain it is to wrap, fold, twist, and pinch. The directions below in the recipe are a lot more detailed but that’s the thought process I use whenever I make these. That being said, expect this to look like a crime scene while your twisting it, some of the raspberry sauce will spill out and this will look like a mess before it becomes beautiful, like us during puberty or our 20’s if your like me. Proofing: proofing is what you do to let the bread rise and hopefully double in size. The yeast in the dough allows this to happen, you need a warm dry spot in your kitchen and a damp dish cloth to put over the knots. Kneeing: When it come to kneeing the dough there are two, the first comes when your just making the dough, the dough seems really eggy and you think you’ve ruined it, first off: you didn’t and second: flour that surface good because your about to use a lot of flour, once the flour no longer sticks to your hand then put it back in the bowl (cleaned and greased of course) and wait, this is when the second kneeing will commence, this time you knee it for almost 10 minutes, your arms will be tired and you will feel like the hulk deflated, but you’ll notice the difference, this time the dough is shinier and less elastic. This is the main amount of information needed for this recipe. If your not aware on how to knead dough here is a little video by ACHFoodCompanies on how to do it. The top picture is after the second kneeing and the second one is the first. Do you notice the difference? 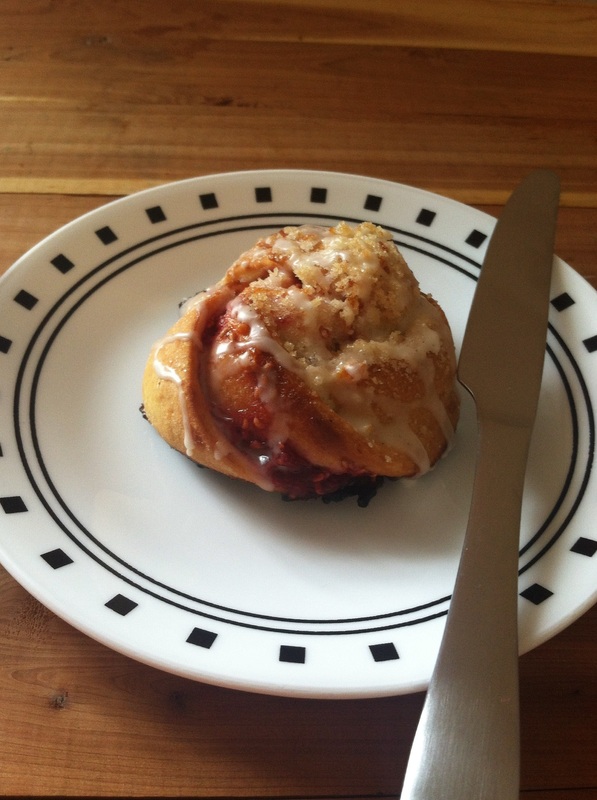 Ta-Ta-For-Now: Last and least, when it comes to baking, make sure you put some extra sugar, orange sugar if you made enough, on top of the knots, it creates and great crust and since all the sugar doesn’t melt it has a gorgeous crystal look to it. 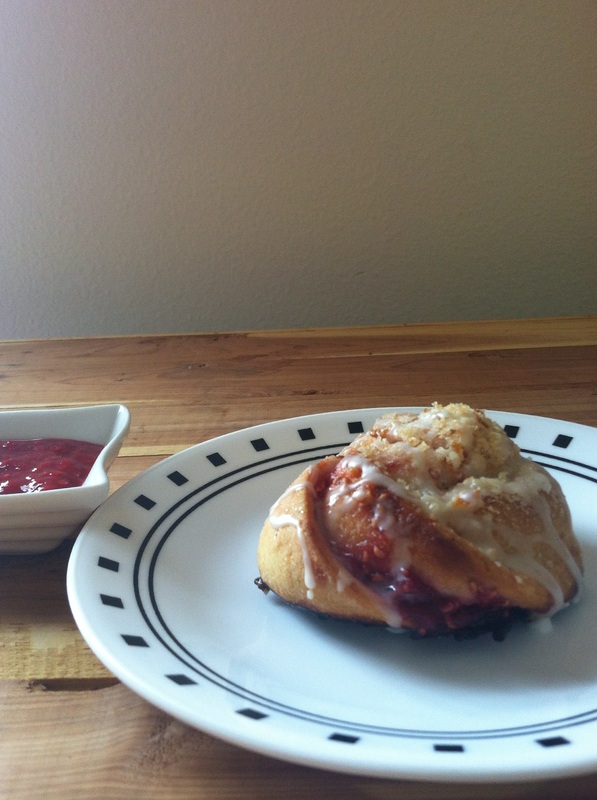 This recipe just screams fancy! I hope you all enjoy it and feel confident enough to make it, because while this may seem a little difficult at first, it’s truly so easy. It’s just a lot of little steps that eventually become a fancy pastry that defies what you ever thought you were capable of making in the kitchen. ENJOY! This should be noted than these steps are optional. If limited on time or you just don’t feel like doing this, regular raspberry jam heated up and watered down with 2 teaspoons of water will do just fine as well. In a small sauce pan, add the mushed raspberries, lemon juice, triple sec, and orange sugar and cook down until most of the liquid is gone (about 30 minutes) put raspberry spread in a heat safe bowl and let cool down to room temperature before putting it in the fridge to chill down completely and thicken up some more. Side note: there have been times when friends of mine using this recipe have cooked it down extremely thick and they basically were not spreading it on anything, this is easily salvageable. Add about 3 tables – 1/4 cup of orange juice and it should loosen right up and go back to being spreadable. Dissolve the yeast in the warm milk, once the yeast has softened (you’ll know because the once hard yeast dots are now soft (almost like break in milk or water), mix in the flour, the mixture will be crumbly, follow this step by adding in the sugar and salt. Add, 1 tablespoon at a time, the soften butter, then add, 1 at a time, the eggs, the mixture will look wet and goopy this is fine, it’s supposed to be that way. Once you start the next step everything will come together. Bring the dough to your floured surface, and begin to work dough until the dough is elastic and detaches from fingers. 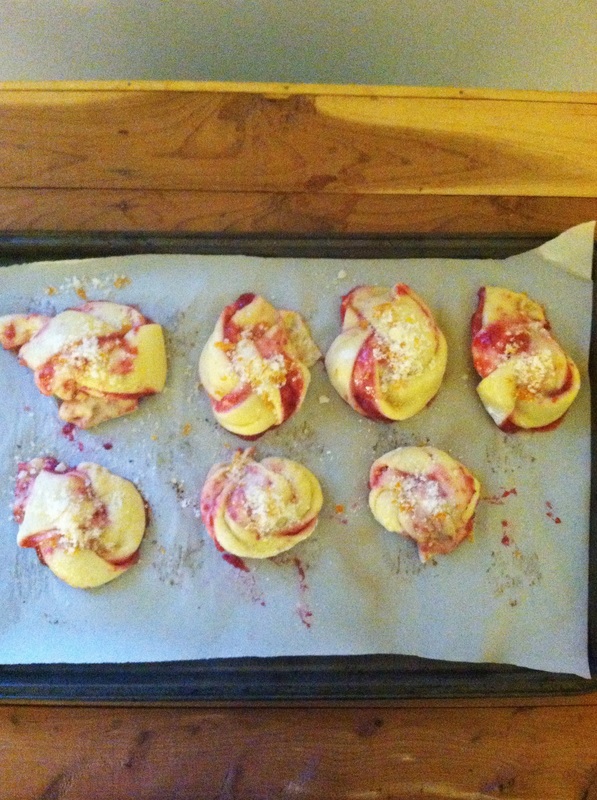 You will use a lot of flour but this will happen fairly quickly, no longer than 3 minutes. Don’t throw the flour away; you’re going to use it again, so there’s no need in wasting flour. Bring the dough back to the large, now cleaned, mixing bowl that has been wiped with butter, cover the bowl of dough with a kitchen towel and let rest for 2 hours to double in size. It won’t look like much, but after the second rising process, it will grow even bigger and become even softer. 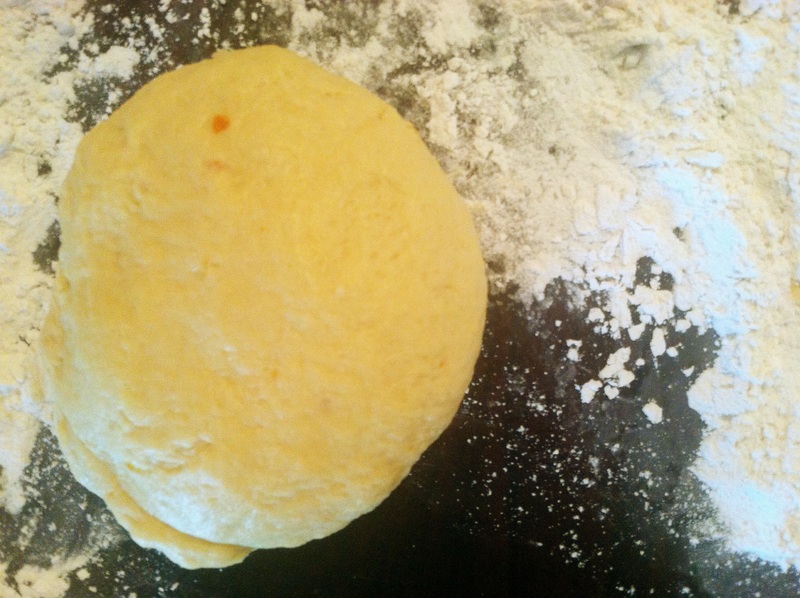 After your dough has risen, bring it back to the floured work surface and work (knee) the dough for 5 to 10 minutes, this will become tiresome but you will notice the dough is now shiner and when you poke the dough with your finger there should be some give to it. Let bring the dough back to the bowl, cover it and let it rest for another 1 to 2 hours. 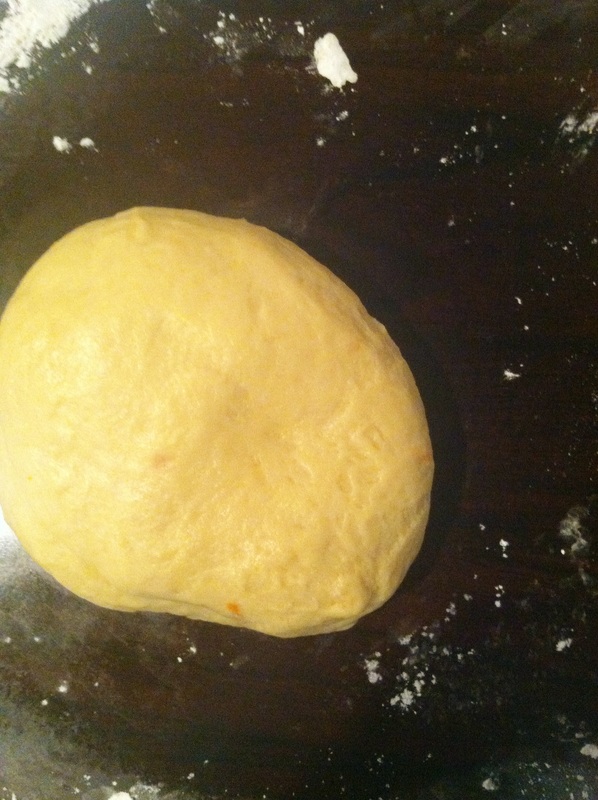 Bring the dough back to the floured sugar and use your rolling pin to roll the dough out to about 1/8 of an inch. Use a knife, offset spatula, or a flat edged tool to spread your raspberry mixture over the open surface; don’t spread too much, only a thin layer is necessary. Flip one side over the other and then use your knife or pizza cutter to cut the dough into long spaghetti like strands. Follow the next steps slowly. Take each stand and knot it, take the strand, flip it over one hand, use the other hand and tie it into itself, after you do that take the other ends and pinch it into the dough itself. It should look a bit like a challah knot. Once all the strands are knotted, lay them onto your baking tray and put the kitchen towel back over them and let the rise once again for about an hour. Melt about 2 tablespoons of butter and using a pastry brush, brush the butter over the knots and then pour some orange sugar over the knots. Bake at 375°F for 10 to 15 minutes. Keep an eye on the rolls. 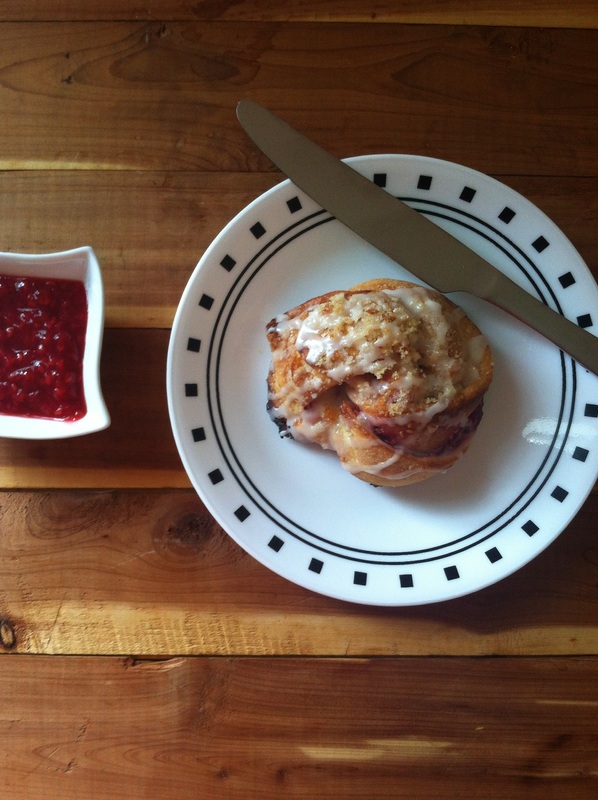 Let it cool and at you’re choosing you can glaze your knots or just cut it open and spread some jam over it. Take this thing to a party and show off those fancy baking skills you’ve acquired.